​How do you adapt a Parent-Child Mother Goose program to deliver it to pregnant and parenting young people aged 15 to 21 years who are either expecting a baby or already have an infant with them in class? ​This has been the challenge faced by Kathrine Bray, an early parenting practitioner who, for the past 15 months, has been facilitating a weekly two-hour 'Parent Ease program' that combines elements of Parent-Child Mother Goose and early parenting education as part of an innovative Young Parent Education Program (YPEP) running at Learning Hubs now operating at two locations in Melbourne's outer southeast. Participants in YPEP are all young parents or parents-to-be who want to complete their secondary education. 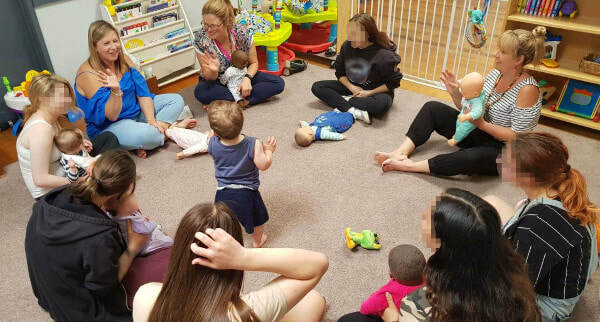 They attend classes at their Learning Hub three days a week with their babies and study the Victorian Certificate of Applied Learning and a Certificate 2 Vocation Education and Training qualification at the same time. ​As Kathrine has learned, the challenges these determined young parents and parents-to-be are facing typically go well beyond juggling parenthood and a student workload. ​"The young parents in our classroom are often going through major life issues," Kathrine says. "They may be experiencing a relationship breakdown or extended family issues. They may be dealing with the Department of Human Services. They may have housing difficulties, or be coping with Family Court proceedings in the middle of their studies. On top of that, they have to deal with feeling that others are looking at them and judging them. They're under a lot of stress. At the same time, they all want to do more with their lives, both for themselves, and for their children's sakes." ​Kathrine says introducing these young women to the Parent-Child Mother Goose program from scratch has been quite challenging, as most have not had songs or rhymes sung to them as a child. An experience of nurturing warmth frequently puts them outside their comfort zone. ​"We run a two hour session at each Learning Hub and I always have a session plan, though I sometimes have to throw it out the window," Kathrine says. ​"We'll often start with a craft activity that I'll link with infant brain development or the bond between parent and child. We might make toys from recycled materials or we might create a plate or mug using a child's footprint. While we're doing that, I'll talk about the importance of touch, or if we're making something for a grandparent, I'll talk about the importance of relationships." ​"We talk about the importance of nurturing ourselves, too. We do mindfulness activities like colouring in, which can be a great activity for the young parents to do with a small child later on, too. We prepare healthy finger food together and talk about nutrition. I might show the young parents how to make custard out of the formula their baby hasn't drunk. This isn't typical Parent-Child Mother Goose, of course, but through these activities the young parents start developing a sense of familiarity with us while also absorbing useful insights into parenting." ​How Kathrine and her co-facilitator introduce singing depends on the group. 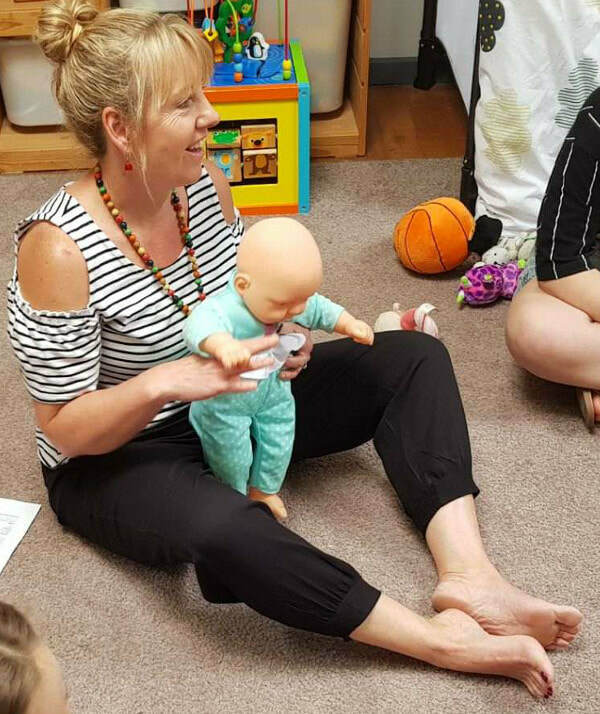 Both of Kathrine's groups in 2019 include young parents who attended last year's program while expecting a child but who have now had their babies. Even before the 2019 program began, some of these were already asking on their closed Facebook group when Mother Goose would be resuming. ​"If you walked into the latter part of one of my sessions last year," Kathrine says, "you might think you'd joined an ordinary Mother Goose session. The young parents will be sitting in a circle with their babies — or in the cases of parents-to-be, perhaps with life-sized dolls — and they'll be singing songs and doing interactive rhymes. We probably won't have a folk tale, but we might make up an interactive story based on 'Three cheeky monkeys jumping on the bed', say, or 'The wheels on the bus' song. We'll model infant massage as we go or model how to move the children's legs as wheels. I might also mention the benefits of doing this with a child who has wind pain." ​Kathrine says that once the young parents become familiar with songs and rhymes, there's often a 'ripple effect' as they start to notice that their babies respond, for example by ceasing to cry or fuss when they hear their mother (or father) singing a familiar song. When starting an entirely new group where no-one has any prior experience of Parent-Child Mother Goose, Kathrine introduces songs whenever suitable occasions arise during craft or food preparation activities. 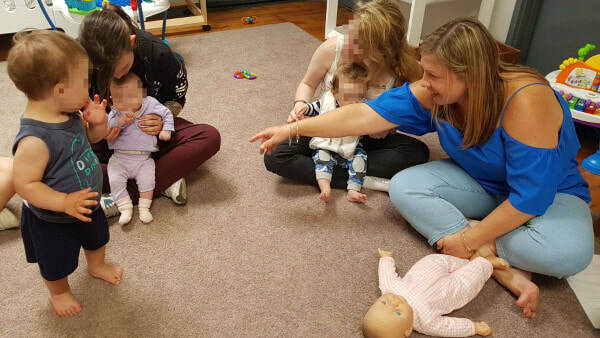 As well, her co-facilitator might sing to the babies on the floor while Kathrine is working with their parents elsewhere in the room on some activity. ​"I believe it really is Mother Goose we're delivering," Kathrine says. "We're delivering it in a very flexible way though, to help us connect with these very vulnerable young parents." ​As an example of the kinds of sensitive issues that can arise for participants in a program like this, Kathrine recalls an instance when a young mother-to-be was tracing her fingers across the face of a doll while speaking the words of The moon is round, and this was enough to trigger a strong adverse trauma reaction. ​"These young people may have had a background of physical or sexual abuse that is always in the back of their mind when they're parenting," Kathrine says. "They may have had a stressful birth experience. Their own mum may not be around to show them how to do something. No matter how 'well' we deliver our program, my co-facilitator and I rarely come away from a session on the kind of 'high' I've often experienced working in other Parent-Child Mother Goose programs. To do this kind of work, you need strong self-care skills yourself, and you certainly need the ability to see positives in the small things — a little eye contact here, a smile there." ​After each session, Kathrine and her co-facilitator spend time together comparing their observations, which Kathrine writes up in detail weekly. These, in turn, form the basis of reports Kathrine submits to those co-ordinating the YPEP, together with before and after survey results which Kathrine gathers from participants. ​Kathrine has been told her observations, in particular, have been very valuable, and these are likely to be one element among others feeding into a formal evaluation of YPEP to be conducted later this year by Monash University. ​In the meantime, what is Kathrine's own sense of the value of her weekly two hour sessions with these young parents and parents-to-be? ​Kathrine says she believes that through Parent Ease she's helping to make a difference in the lives of these young people, but acknowledges the evidence is often subtle. ​"We had a young mother-to-be in our program last year who rejoined us this year after having had her baby. When she came back, I asked her what songs she was singing to her baby. It turned out her favourite was The ants go marching one by one, which I probably wasn't expecting. It was clearly empowering for this young woman, though, when we took up this song as a group and began singing it together for her and her baby and for all of us. These young people so often feel unworthy and insignificant. Any way we can empower them and let them know they're doing a great job has to be worthwhile."